Heading Is On The Way Out For The Youngest U.S. Soccer Players : The Two-Way U.S. Soccer has agreed as part of the settlement of a lawsuit to eliminate heading for players 10 and under. Most kids don't play under the group's control, though, so the rules don't apply to them. 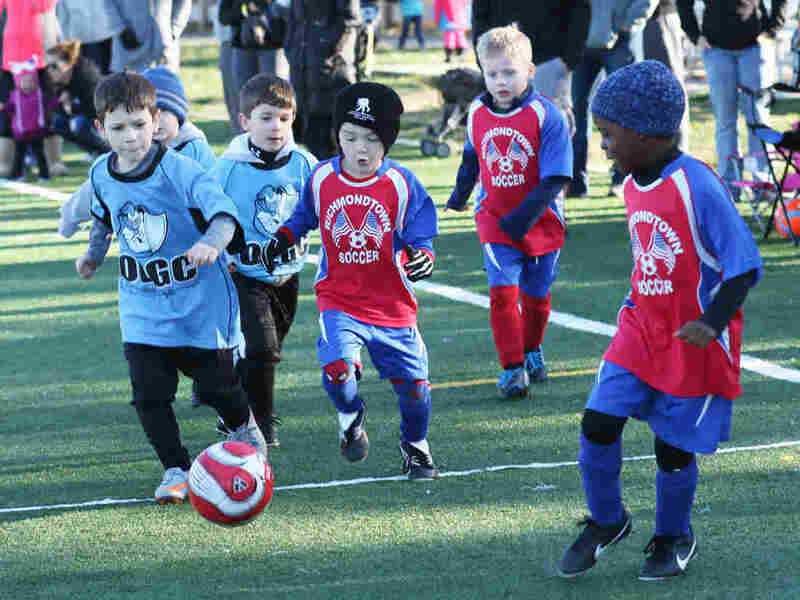 Children on Staten Island, N.Y., playing soccer. U.S. Soccer says it strongly urges all youth leagues around the country to follow the guidelines. There are new safety rules this week targeting concussions in youth soccer. As part of a lawsuit settlement, the United States Soccer Federation has announced new restrictions on striking the ball with the head. The new rules eliminate heading for players 10 and under, and limit heading in practice for 11- to 13-year-olds. The restrictions go into effect next month and apply to players on U.S. Soccer's youth national teams and Development Academy. That's only a small percentage of the more than 3 million kids who played soccer in the U.S. last year. For all those players not directly controlled by U.S. Soccer, the new rules are recommendations. Still, U.S. Soccer says it strongly urges all youth leagues around the country to follow the guidelines. The group also has agreed to modify substitution rules in games to allow players who may have suffered a concussion to be evaluated without penalty. The new guidelines are part of a settlement of a lawsuit filed last year. A group of parents and players filed a class-action suit against U.S. Soccer and others, claiming the defendants had been negligent when dealing with player concussions. The plaintiffs weren't after monetary damages but instead wanted the kind of rules changes that were announced this week. Steve Berman, lead attorney for the plaintiffs, said, "This is a tremendous victory that will affect millions of young soccer players across the country." He added, "We believe this decision sends a strong message to coaches and lays down paramount regulations to finally bring safety management to soccer." Questions remain about how the regulations will be enforced, and about whether headers truly are the key culprit when it comes to soccer concussions. One recent scientific study acknowledges headers play a role in head injuries. But it finds that rough play — "athlete-athlete contact" — is a significant contributing factor.